Health Sciences provides a foundation in and a broad overview of health care, building skills in identifying, investigating, analysing and assessing health issues. Health science focusses on the practical aspects of health – understanding the anatomy, physiology, pathology of disease, as well as preventive strategies in health. It takes a broad overview of medicine, nursing and allied health in practice. This course has outstanding flexibility in curriculum, making it a great option for students with a keen interest in health sciences, but who want time to explore before choosing a career path. The course is styled so students can choose electives from across the entire university. 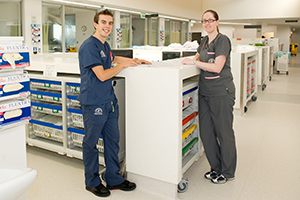 The core units give you a solid foundation in health, healthcare and research that prepares you to join the health sciences workforce in Australia or overseas. Our graduates enter the job market armed with essential knowledge in biomedical science, population health and preventive health, and the analytical skills to think critically and make evidence-based assessments. You can tailor this degree to a specific field of health science as you learn what it is that excites you. Wondering if health economics could be interesting? Pick up a commerce unit and try it on for size. What about some business units to see if health management is a better fit? The gift of the gab and some marketing units could steer you towards pharmaceutical sales. Or consolidate with public health units to see if big impact health research is the right field for you. The Bachelor of Health Sciences will lead you to a variety of career options and job market growth in the health, local government, and workplace and education sectors continues unabated. It is also a convenient stepping stone to vocational degrees such as medicine, nursing, social work and dietetics. Finally, it is also a pathway to a rewarding career in public health research via postgraduate study with Monash Public Health and Preventive Medicine. For more information on our postgraduate education options, please click here.